Health Shakes are more than a trend, they are a long term investment in health and the cornerstone of a nutrient-dense eating plan. Once you begin enjoying your Health Shake in the morning you’ll notice a difference in how good you feel about yourself and how easily you handle the decisions you are faced with that day. If you’re on a conscious road towards getting healthier or losing excess weight and fat then adding a Health Shake to your life every single morning will give you magical results. 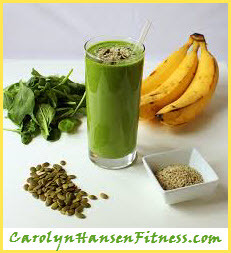 Nutrient-dense foods are key players and critical to combating weight loss resistance and enjoying optimal health. They supply us with a hefty amount of important nutrients like proteins, carbohydrates, vitamins, minerals, fats, and water while generally light on calories. There’s no quicker or more effective and efficient way to get on the nutrient-dense eating track, experience better health and quell intense cravings than to make yourself the perfect Health Shake every single morning and enjoy some of it within an hour of waking. This particular kind of shake satisfies quickly and you will not need to worry about getting hungry “pangs” and eating again for hours. They easily maximize your micro-nutrient consumption and are the quickest road to losing weight and feeling fantastic. They are rich in health-promoting proteins, essential fatty acids, real food carbohydrates, water, vitamins, minerals, fiber and important phytochemicals that include live enzymes used by the body to aide digestion among other things. It’s time to invest your time wisely by allotting 3-4 minutes every morning to making a Health Shake. It is a whole lot less stressful than grabbing and eating “whatever, or whenever” and experiencing the resulting metabolism slow down, weight gain and energy loss as a result. The typical weight loss results that most people experience after adding in a morning Health Shake generally range around losing 10-20 pounds or more of pure fat in just the first three months. It’s easy to see how, for some people, this can truly be a life-changing strategy. A properly made morning Health Shake provides at least 50 percent of our daily nutritional needs. Liquid…you can use water, almond or any nut milk as well as unsweetened coconut water. If you should opt for coconut milk make sure you choose “full fat coconut milk or cream” and not the watered down kind. The idea is to get lots of healthy fats so always reach for the finest quality milk or cream you can find. 1 frozen or fresh green leaf vegetable of your choice. You can choose silver beet (chard), spinach or kale for example or choose to use 1 scoop greens powder. Adding chia seed and flax seeds are essential because they are the magic ingredients to making us feel full and staving off hunger pains for 4 or more hours. Although you can make your shake without them, you will not experience the same kind of results so always try to include these magic seeds in your morning Health Shake. Note: You can choose to make your own almond milk at home by blending in a high speed blender 2 cups water with 1 cup raw almonds. Strain and keep refrigerated. Make sure to drink some of your freshly made morning Health Shake within an hour of rising to get the maximum morning benefits. You can easily store the rest in a cooler bag and take it with you. Infusing your body with a super-nutrient Health Shake first thing in the morning empowers you from within and your daily challenges are much less stressful. Whatever you do…just get it into your tummy and the rest of the day will be easy. Consciously, with effort, develop these positive habits, and you’ll strengthen your inner resources, reinforcing all healthy habits and propelling yourself towards real health, real growth and real success.